Amazon Fresh, which is basically Amazon's own grocery store. It's an ideal delivery service, but only available in limited areas. Amazon Prime Now, which offers a lot of Amazon items, including groceries and perishables, with two-hour delivery. 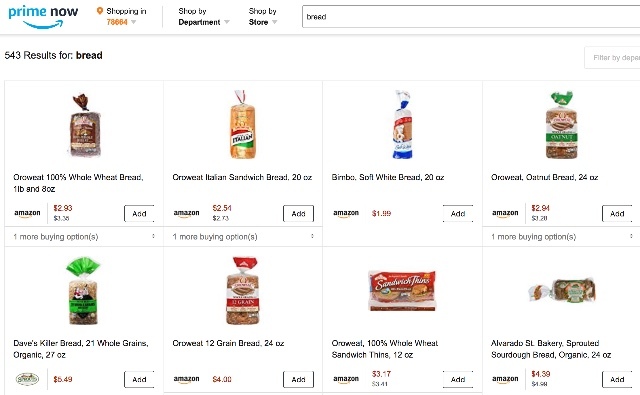 Amazon Prime Pantry, which focuses on non-perishable pantry staples with a flat delivery fee. Amazon Subscribe and Save, which delivers the things you need regularly (like vitamins or paper towels) on a once-a-month schedule. This mishmash of services can be confusing for anyone who just wants grocery delivery — but buying Whole Foods is definitely a sign that Amazon plans to do more with groceries. While we wait for Amazon to figure out just what it's doing with Whole Foods, here are five great ways to get groceries delivered to your doorstep. Your delivery, which can include milk, produce, frozen goods and other perishables, should arrive on your doorstep within two hours — all for the cost of an Amazon Prime membership ($99/year). And though grocery selection isn't as broad as the stores on this list that focus on groceries, it covers all the staples — and it's an easy way to get must-haves delivered quickly without having to stop at the store. If you aren't in Prime Now's delivery area, Prime Pantry and Subscribe & Save are both good ways to get non-perishables — but you'll have to look to different options to get produce. What you can order: A selection of over 25,000 Amazon products, including groceries, household items and even electronics. Delivery fee: Available only to Amazon Prime members ($99/year). Members get free two-hour delivery or $7.99 one-hour delivery. Boxed is an online warehouse club without the warehouse club subscription fees. 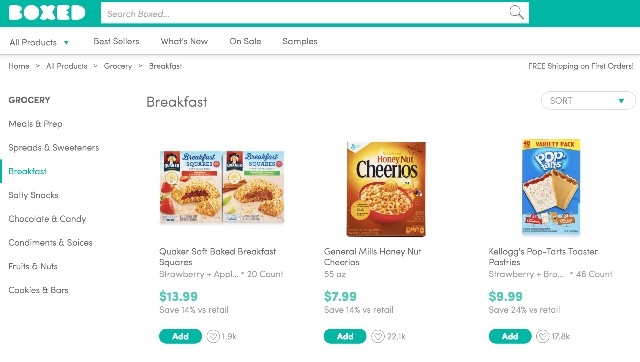 The service offers bulk sized versions of your favorite grocery items, so you can keep your pantry stocked without a drive to Costco or Sam's Club. And while the prices aren't quite as good as your local warehouse club, they're good enough to make the cost worth the convenience. The downside is that, like those warehouse clubs, Boxed has a limited selection of products. The service offers a wide range of items from popular brands, but if you're particular your brand of toilet paper, for instance, check their stock first. You'll find Charmin, but not Quilted Northern or Cottonelle. And unlike grocery delivery services that offer fresh produce, Boxed ships to almost the entire country (the greater 48 states) via either FedEx or UPS. However, if fresh produce is what you want, Boxed does that via a service called Boxed Express. When you place an Express order, you pick a specific date and time for your groceries to be delivered. A Boxed shopper goes to pick them up at a local store and then leaves them on your doorstep. Because of its need for local staff, Boxed Express is only available in select areas: enter your zip code on the Boxed homepage to find out whether it's available in your neighborhood. 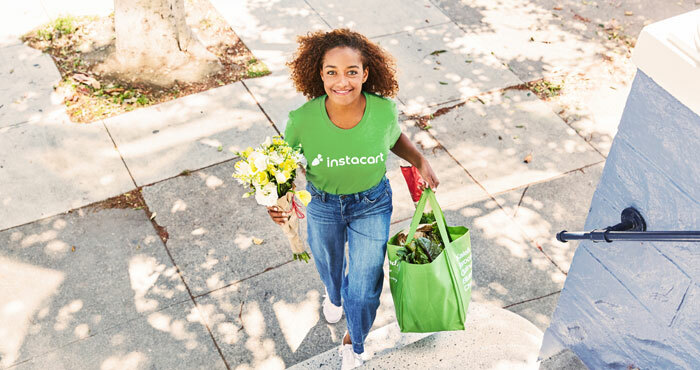 With Instacart, you basically have a personal shopper pick up your groceries for you. This means your groceries are selected with as much care as if you picked them out yourself, so you shouldn't have to worry about winding up with bruised bananas. You can even specify substitutions if something is sold out or have your shopper call to ask what you want if something isn't available. Pricing can be a point of confusion with Instacart. The company's prices don't match in-store prices. Sometimes Instacart's prices are higher and sometimes they're lower — you aren't necessarily getting a bad deal, but it's easy to be confused by the price tags. The company also charges a service fee (automatically set at 10%, though you can change it), which is a tip for your shopper. Still, it adds to your cost, especially if you aren't paying attention to the percentage. Perhaps the most frustrating added expense, however, is the Uber-style "busy pricing," which increases the shipping cost during particularly busy times of day. While it's certainly avoidable, it does reduce the convenience of being able to get your groceries delivered for a predictable price, anytime. But simpler shipping comes at a cost: a $99/year Instacart Express membership offers free shipping for orders over $35. If you like the service enough to use it for your regular grocery shopping trips, it's worth the cost. Instacart doesn't cover the whole country, but it does cover a good area of the south and northeast. If it doesn't reach where you live, try Shipt or Peapod instead — the services are quite similar, but all have different coverage areas. Delivery fee: Starts at $3.99 for two-hour delivery or $5.99 for one-hour delivery. Pricing may be higher for larger grocery orders or during busy times of day, so pay attention to the shipping cost at checkout. Instacart Express membership ($99/year) comes with free shipping for orders over $35. This service from Google is less of a grocery delivery service and more of an everything delivery service. 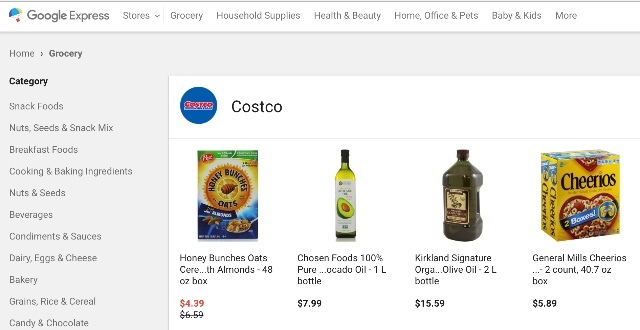 Google Express delivers items from local stores, including grocery stores, often same day. That's faster than you would get goods via ordering online (at least without shelling out for pricey shipping fees). However, despite a range of stores to choose from — including Whole Foods and Costco — you can't get fresh produce or anything the needs to be kept refrigerated. So they have boxed milk, like the ones you'd pack in a child's lunch box, but not your usual half gallon. The convenience factor here is getting everything you want from one place and in one order. Instead of having to stop by a grocery store, a warehouse store, and a pet store, you can place your entire order on Google Express and have it show up at your house within a day or two. The trouble comes if Google Express doesn't cover the retailers you'd like to shop with: which means you're still making a trip to the store. Minimum order: $15 for most stores (though some stores may require up to $35). A small order fee of $3 is added if you don't meet minimum delivery requirements. Delivery fee: $4.99, with potential extra charges for bulky items. 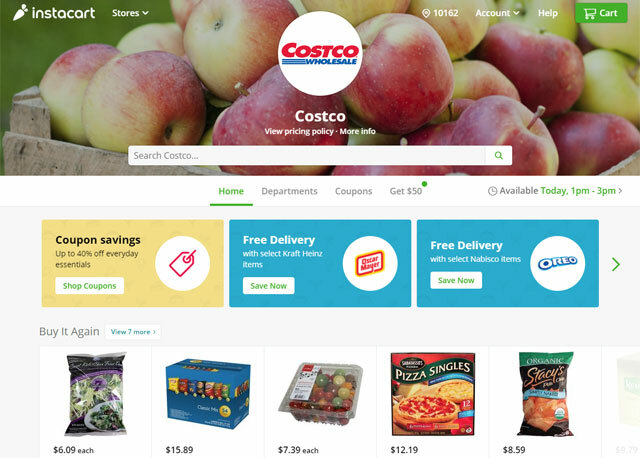 Ordering from Costco if you aren't a member costs an extra 10% per item. Google Express members ($95/year) get free shipping on items meeting minimum requirements, but will still be charged other fees (for small orders, bulky items, or Costco). Walmart offers both grocery delivery and same-day in-store pickup. While pickup isn't quite as convenient, the fact that most of us have a nearby Walmart can make it easy. You just drive up, grab your groceries (which Walmart employees will even load into your care for you) — and pickup is always free. One downside, however, is that neither of these services is available at every Walmart. You'll want to check your local store for availability. Pricing is a big advantage of Walmart over the competition. Not only do Walmart's prices start low: the company doesn't mark up items for delivery or pick-up. If a price changes between when you place your order and when you pick it up, Walmart will refund your money. Another cash saver: Walmart employees can't accept tips, which can be a point of confusion with many other delivery services. 1) Ordered twice from Instacart. First time 4 of 12 items were missing. Second time 7 of 13 items were missing. Ended membership. 2) Peapod (which is Stop ‘n Shop) has cheaper prices than Fresh Direct and some other services, but they are frequently late in delivery and it’s rare that you get 100% of what you ordered. Their packaging has gotten better—ice cream always used to be half melted but isn’t any more— and their delivery people don’t complain as much as before, but their produce is inferior and they stop carrying stuff—like their good, cheap Stop n Shop frozen yogurt, which suddenly disappeared. Still, for non-perishables, standard brands and good prices, they’re satisfactory—as long as you aren’t on a strict time schedule.